With spectacular scenery, friendly people and a relaxed lifestyle, Southern Tasmania provides a wonderful place to call home. Be it your permanent home or a holiday home, building in Southern Tasmania is a smart choice. As you start planning your build, here are 7 things you need to consider. Tasmania has four distinct seasons with the warmest months being December to March. The average maximum daily temperatures in summer are between 17 and 23 degrees while winter temperatures sit between 3 and 11 degrees. In terms of rainfall, the south is home to some of Tasmania’s driest regions, with Hobart being Australia’s second driest capital city after Adelaide. Close to the coast the temperatures can be cooler with a series of cold fronts coming in from the Southern Ocean. Much of Tasmania is composed of Jurassic dolerite intrusions (the upwelling of magma) through other rock types, sometimes forming large columnar joints. 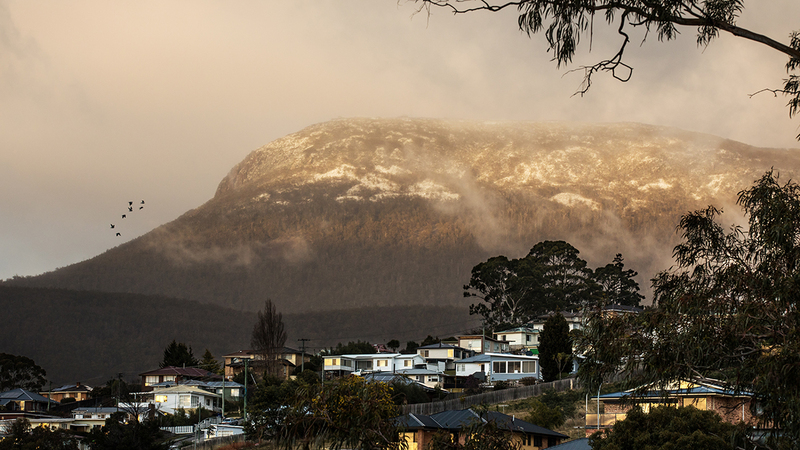 Mount Wellington just north of Hobart is a good example, showing distinct columns known as the Organ Pipes. In the south, the dolerite is underlaid by sandstone and similar sedimentary stones. Owing to a relatively dry climate and its alkaline parent material, soil presents a different story to the soil in the rest of the state. Mostly classified as “prairie soils” or “brown earth soils” it bears some resemblance to the chernozems of Russia and North America. Somewhat acidic in the surface levels and high in nutrient levels, the soil supports productive pasture. Large numbers of sheep are grazed in the region and grain crops and apples flourish. Likelihood refers to ‘the chance of something happening’, the frequency of something occuring and the impact it will have. The risk rating is expressed as High, Medium or Low. In Southern Tasmania, bushfire is considered the most significant natural hazard. In 1967, fires swept through Hobart and resulted in the deaths of 62 people. Until the Black Saturday bushfires in Victoria in 2009, this was the highest number of fatalities from bushfire in a single day experienced in Australia. Frequent storms and wild winds are not uncommon in Southern Tasmania and mitigation actions for storms are also included in building standards. The Hobart Interim Planning Scheme 2015 includes a Significant Tree Code, recognising the use, character and value that garden and street trees contribute to the urban environment. The list initially comprised of trees included on the National Trust of Australia Significant Tree Register but has since welcomed nominations from members of the public. Nominations for additions to the Significant Tree Register closed on 21 May 2018. A total of 200 nominations were received. 115 of these were for individual trees and 85 were for groups of trees containing approximately 1400 trees. An update of the Register will be announced soon. The region’s water sensitive urban design guidelines are intended to help lessen the impact that urbanisation is having on Tasmania’s waterways and offer an improved standard of water management in new and existing development. The guidelines include 12 sets of Practice Notes for greater efficiency in water use and reuse. The guidelines can be downloaded here. If building a kit home in Southern Tasmania the work will either be deemed “Medium Risk” or “High Risk”. If it’s a Medium Risk an application (Notice of Work) is made to a building surveyor for a Certificate of Likely Compliance. This can be carried out by a licensed builder with regulatory oversight by a building surveyor. Council will need to be notified that the work is taking place but doesn’t need to give approval. If you are planning to erect your kit home as an Owner Builder or you’re carrying out your build in a hazardous area, you will need to apply to council for a Building Permit. This requires you to go through a full building approval process with council. Plumbing work will also be classed as either Medium Risk or High Risk and will reflect whether or not you need a Certificate of Likely Compliance or a Plumbing Permit. Helping you achieve your housing dreams by providing tailored designs suited to your chosen location is what we pride ourselves on. Whether you choose one of our unique kit home designs, customise our designs or start completely from scratch, the Kitome team is with you every step of the way. Get in touch with our team today to learn more, or download our brochure and discover how flexible we can be.